In December 2013 Paddy O’ Sullivan’s two vessels the Mfv Owenie Padraig & Mfv Tea Rose from Cork were dry-docked at Mooney Boats Ltd to get their annual maintenance work completed. The Mfv Tea Rose had a large 3 Drum split Trawl Winch removed as it’s no longer required due to the vessel seining. Mooney Boats had to cut a large portion of the shelter deck out to remove the split winch. The yard also installed new windows in the wheelhouse as well as fitting a satellite dome on the vessel which was supplied by Barry Electronics in Killybegs. Once on the Synchrolift, the Tea Rose was washed from top to bottom, its rudder shaft was removed from the steering, re-tapered and replaced again. 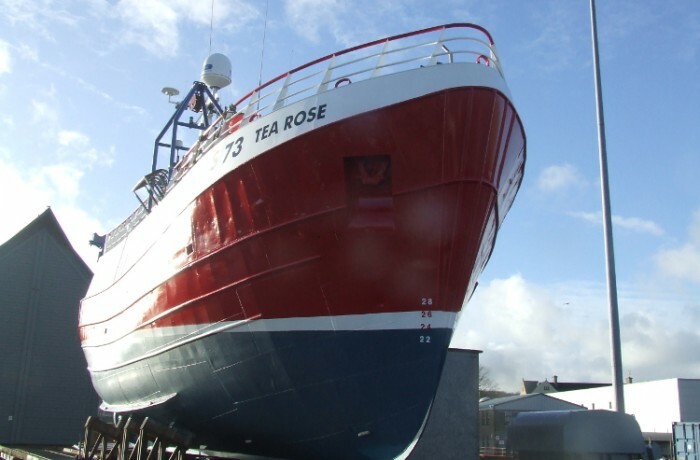 Gerald Bray & Sons Ltd painted the Tea Rose from top to bottom and the vessel was back in the water on the 10th of January and is now back fishing. The Mfv Owenie Padraig was also up on the Synchrolift on the 9th December where she was washed and painted and also got some minor repairs completed and anodes fitted she was put back in the water on the 16th December.